Renting a tent is a great way to protect your outdoor wedding from the elements of New England weather without sacrificing the beauty of the event. 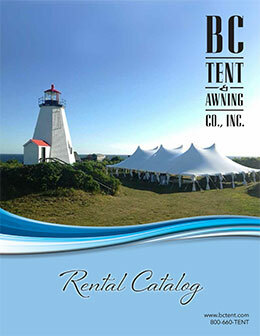 We offer a variety of wedding tent styles including pole tents, frame tents, and our new line of sailcloth tents. We also offer gorgeous décor to enhance your tent including fabric draping and a variety of lighting packages. Whether you are going for a rustic look including farm tables with a starry night lighting package, or a fun atmosphere with paper lanterns and chiavari chairs we can turn your vision into reality. We know that at times wedding planning can seem stressful, but we believe planning the wedding should be as much fun as the wedding itself. Using our unique selection of equipment, our years of experience and our wide variety of partners, we helped thousands of couples have a beautiful and memorable wedding day. 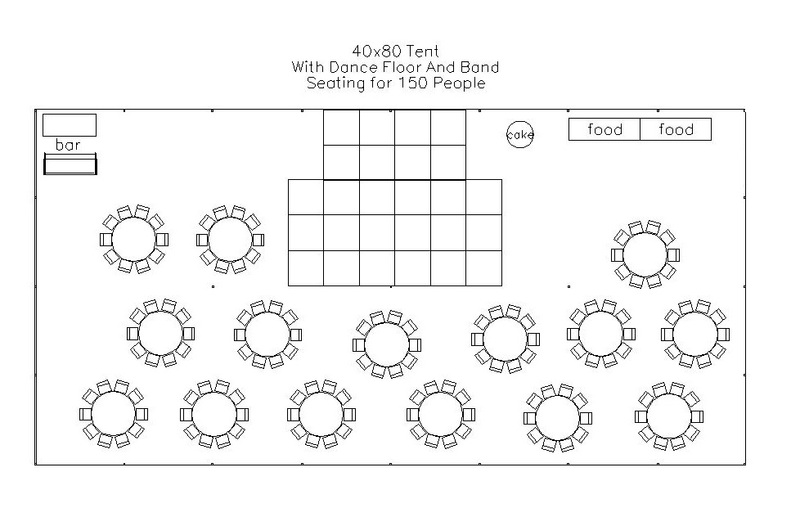 Whether you are planning an intimate ceremony for 50 people or a grand reception with 500 people we have you covered! We offer a 24 hour on call service person to make sure your big day goes off seamlessly. Do you love Pinterest? Share your wedding boards with our wedding professionals so we can really bring your visions to life! We have a Pinterest account and would love for you to get some inspiration from us! Make sure to follow us on Pinterest! B.C. 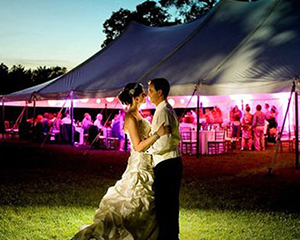 Tent is staffed with professionals to help you plan your big day. 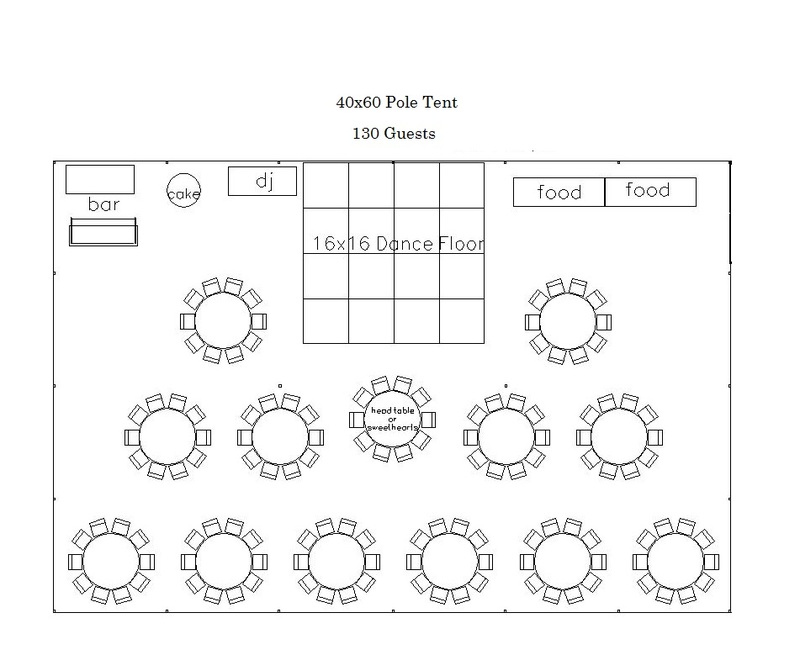 We will work one on one with you to create a perfect floor plan for your wedding. Here are a few samples of our designs. Do you need to rent a tent? What is the surface where the tent will be installed? Can we put stakes into the ground? Would you like Sidewalls for the tent? Will the meal be served or buffet? Will guests be seated or standing? 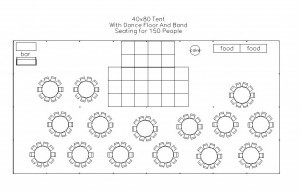 How many guests will be seated at one time? 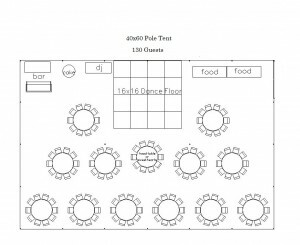 Do you need tables for guest seating? How many guests per table? What style chairs are you interested in? Do you need a stage? What height would you like the stage to be? 8" 16" 24" 32" 48"
How many people on it at one time? How many sets of stairs? Do you need stage skirting? What is the unit being used for or what size are you looking for? How high do you need the opening to be for the door? Who will install the unit? What is the installation surface? In order to provide you with a better service, please feel free to leave any comments or questions here. What is the main purpose for this awning? Are you looking for a retractable awning? Will there be any logo or lettering on the awning? Are you able to upload a picture of the space where the awning will be installed? If there is any other information that may be helpful to us or if you have any questions please include them here.